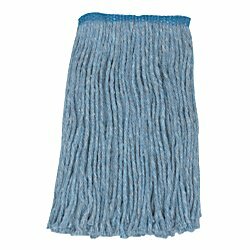 Low cost, high quality cut-end mops feature colored yarn to keep mop looking new. With no break-in required, these absorbent, tough mops go to work right away. Great for all-purpose cleaning. Wide or narrow headbands accommodate any type handle. Colored yarn helps maintain clean appearance. No break-in time is needed. Very absorbent. For commercial and food service use. 1.25" tape band. For commercial and food service use. Use with Pinnacle handle.